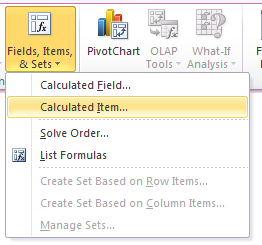 Today, lets understand how to use Calculated items feature in Pivot tables. We will use a practical problem many of us face to learn this feature – ie calculating conversion ratio from a list of sales calls. 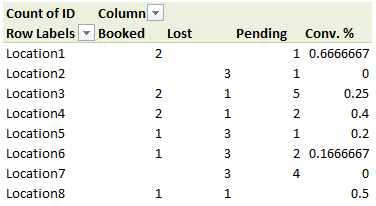 I have a spreadsheet source data full of sales enquiries which have the Status – Lost, Booked or Pending. Each sales enquiry relates to a particular location. 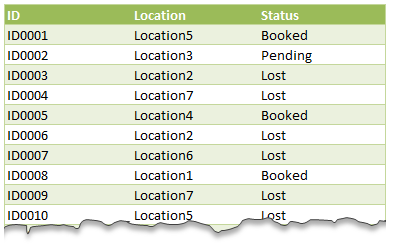 I have created a pivot table which counts the enquiries and displays them with the Locations in rows and the Status in the columns. I have got a row total showing the total number of sales enquiries for each location. I also want my table display the sales conversion number, ie the booked enquiries as a % of the total enquiries. How do I do this? Lets say, you have some data like this and you want to understand what is the conversion ratio by location. 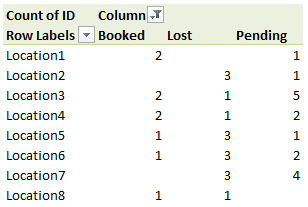 Select any column label item in the pivot table. Now you should see another column in your pivot table with calculated item – Conversion %. This will automatically transform all numbers smaller than 1 (ie all conversion %s) to percentage format while keeping everything else normal. Since calculated items can be somewhat tricky, I made a short video explaining how this works. In the video you can also see how to use Power Pivot measures to calculate conversion ratios easily. Watch it below (or on our youtube channel). Click here to download example workbook. It has both regular and powerpivot based calculations. Go ahead and examine them. Enjoy. Do you use Calculated items? I find calculated items to be very tricky to work with. In most cases, I try to add extra calculations to original data table or use formulas instead. But this example is a good case where calculated item is perfect. What about you? Do you use Calculated items? In what situations you use them? Please share your experiences and tips using comments. If you are use Excel pivot tables & data analysis features, then you will find below resources very useful. Great post. I still have trouble at times deciding whether I need a calculated ITEM or FIELD. This is very helpful. Probably an obvious answer, but I'm missing it -- why the custom number format for anything >= 1 as number. Why not leave it a percent, which would be 100%? Wouldn't that be what we want it to show? The only time it would be 1 is when all were booked, so that would be 100%, right? how is this different from calculate field. I found this [>=1]0;[<1]0%;”" had to be changed to [>=1]0;[<1]0%;""
small difference but might be worthwhile to someone. I would like how do you do the same with PowerPivot? 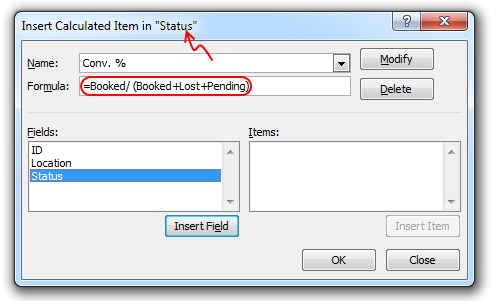 In PowerPivot, the option to insert "calculated item" is not available. In the Second It should be BCE as its updated. kindly suggest. How would you do a cumalitive sum calculated in a pivot table? What is the difference between Calculated Item and Calculated Field? In the downloaded file there is "Grand total" for each row. But it sums up conversion ratios also, and it seems useless. This Site Really Contain Good Info. I'm trying to do a progress spreadsheet that will track monthly progress, by tying one worksheet (with pivot) to another that will also convert figures from the pivot into a chart on a separate worksheet. But what if there was nothing for a few months? What is the best command or formula to use to pick up that for some months, there is 0? For the above example, if the location is divided into countries (adding another row label), does the calculated item work? ?